MT. 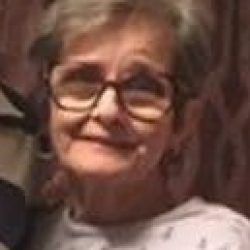 CARMEL – Judy Snapp Mellons, 74, passed away on Tuesday, April 9, 2019 at the Wexford House. She was preceded in death by her husband, Kyle D. Snapp; daughter, Kathy Snapp; parents, G. K. and Nell Marshall; brothers, Luke Morelock, Jimmy Morelock, Buddy Morelock, and Clyde Morelock; sisters, Blanch Box, Ruth Goad, and Joyce Flanary. Judy is survived by her son, Eric Kyle Snapp; daughter, Linda Snapp Carpenter; grandchildren, Aaron Carpenter, Lance Carpenter, Ryan Carpenter, Erica Snapp Barnett, Amber Snapp Petrovich, and Kyle Ethan Snapp; great grandchildren, Tristen Lear, Chloe Barnett, Silas Barnett, and Kamdin Petrovich; brother, Donnie Marshall; sisters, Martha Jobe and Phyllis Mathis. A visitation will be held from 7:30 – 8:30 PM on Sunday, April 14, 2019 at the Johnson-Arrowood Funeral Home. A funeral service will be conducted at 8:30 PM in the funeral home chapel with Pastor James Adams officiating. A graveside service will be conducted at11:00 AM on Monday, April 15 at Liberty Hill Cemetery. Those wishing to attend the graveside service are asked to meet at the funeral home by 10:15 AM to go in procession. Pallbearers will be family and friends. Johnson-Arrowood Funeral Home of Church Hill is honored to serve the Snapp-Mellons family.